USA China freight forwarding - Has Trump's new trade barriers affected it? Will any disruption come to USA China freight forwarding from the Section 301 update on 1 August 2018? Tariff increases of up to 25% have now been scheduled on many items imported from China, and the escalation of a bitter trade war between the two countries looks set to continue. President Trump’s signing of the Miscellaneous Tariff Bill Act on 13 September 2018 might be seen by some as a step to help calm the situation down; however the details show this bill does not improve the USA China freight forwarding environment. 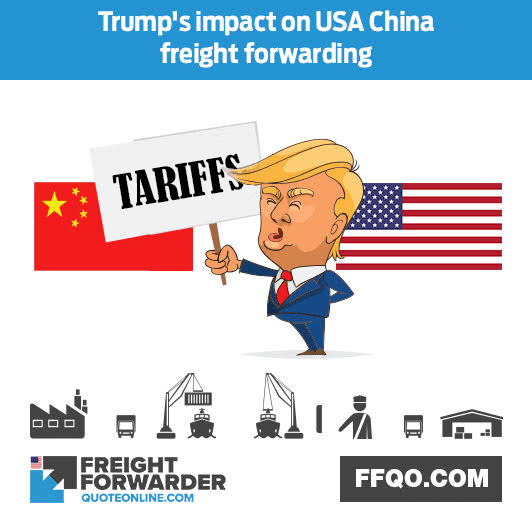 Let’s find out if Trump’s increase on tariffs really affected USA China freight forwarding. President Trump had ordered an investigation to determine the damage caused by the discriminatory activities of the Chinese government. It was important to confirm if and to what extent these discriminatory activities had caused harm to American innovation and technology. The findings of the investigation were disturbing for the US. The investigation indicated that Chinese discriminatory activities had caused much harm and intellectual property rights infringements had occurred. This investigation resulted in the several tariff updates to Section 301 of the Harmonized Tariff Schedule of the United States (HTSUS) and the formation of the Miscellaneous Tariff Bill Act (MTB). The updates to HTSUS Section 301 are severe, primarily comprising tariff increases of up to 25% on many items imported from China. The MTB suspends or reduces tariffs for the next three years on most inputs used by US manufacturers, making them more competitive. The MTB does not void any of the 25% tariffs on Chinese imports. Further, the NTB has clauses that ban the importation of certain types of China-origin goods. As a result of the new trade barriers imposed by the US, the Chinese government responded with retaliatory actions that included raising tariffs against US imports. 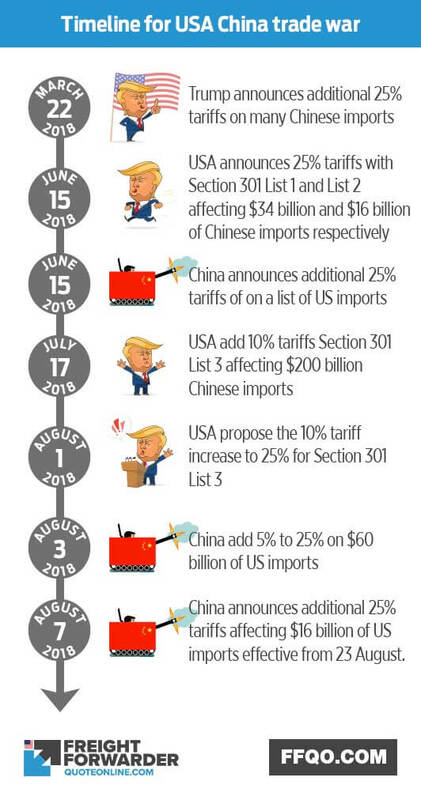 In August China, through the Ministry of Finance, provided a list of retaliatory tariffs on US imports. This is in addition to the 219 tariff items initially listed in June 2018. China has also introduced an increase in levy of up to 25% of US goods. The implementation of trade barriers has damaging effect on imports from China. China produces and exports over half of the items affected by the increased trade barriers. The additional levy duty that was added to Chinese imports has added to costs an extra 10% to 25%. Traders who had already imported the goods will have to add an additional 15% on levy charges. These moves by the US government will no doubt cut down the number of goods being outsourced from China. Many traders have been left stranded with the additional levy fee and have had to dig deep into their pockets to get clearance from ports and warehouses. Currently there is an estimated $200 billion of Chinese import goods caught in the trade war and awaiting clearance. Economists say the trade conflict between the two countries may cause the US dollar to weaken in many countries. This would make US exports more affordable and would increase their industrial output. There is a concern that parts of the large Chinese domestic market may move away from US in the supply of many goods. China may look to sourcing goods from other regions at lower cost. China has been on the forefront of expanding its business territory in the African market. This region offers its products much cheaper than US exporters. The unending on-and-off trade wars between the two countries have left traders and freight forwarders in chaos. Experts say the trade wars should be curbed otherwise they will lead to illegal importation and exportation of goods by unscrupulous traders. Some of them have been pushed beyond their limits and are now seeking a long-term solution. What is clear is that times feel uncertain and that USA China freight forwarding may be on the decrease for a while. On 22 March 2018 President Trump announces and signs a Presidential Proclamation imposing 25% tariffs on certain goods imported from China. This included a levy on information and communication technology equipment, aerospace equipment, and other China-origin machinery. On 6 April 2018 in a notice by the Federal Register, the USTR gave a list of 1,333 items that are subjected to additional 25% levy duties. This is aimed at combating China’s discriminatory activities that hindered or restricted US commerce. On 15 June 2018 the USTR announced a follow up on the 20 June Federal Register Notice which proposed an additional 25% levy to a reduced list (List 1) that impacted on $34 billion worth of Chinese imports effective by 6 July. Furthermore, the USTR reviewed the original list and came up with another list (List 2) that includes 284 items impacting $16 billion worth of Chinese imports. On 15 June 2018 China’s Custom Tariff Commission issued an announcement that it would counter the proposed US tariffs with the same measures. They also proposed an additional levy of 25% on a list of imports that originate from the US. On 17 July 2018 in a notice by the Federal Register, the USTR proposed a third list of section 301 levies on goods from China worth $200 billion. The additional levy was a remedy action to China’s retaliation and its refusal to change the trade acts, policies, and practices the US had seen as discriminatory. The USTR included an additional 6,031 tariff items (List 3) that should be subjected to 10% levy. On 1 August 2018 the USTR made an announcement that the 10% tariff on List 3 goods would be increased to 25%. They proposed a public hearing, settings deadlines of 18 August for oral comments and 6 September for written submissions. On 3 August 2018 the Chinese government through its Commission for Customs Tariff, issued potential countermeasures on US imports worth $60 billion. This was aimed at counterbalancing the 5,207 items that were subjected to additional duties ranging from 5% to 25%. On 7 August 2018 the USTR announced in a statement that it had finalized List 2 and that 279 tariff items on Chinese imports had been added to the list. These items would be subjected to the 25% additional import duties effective from 23 August. On 7 August 2018 China Customs Tariff Commission issued a statement on how they would counter the 25% levy imposed on their goods. They announced a list of US imports worth $16 billion that will be subjected to the additional 25% levy duties and also said the move would be effective as from 23 August. It is evident that the ongoing trade war between the two countries will most likely have an adverse effect on USA China freight forwarding. If you are an importer or exporter in these countries you should closely work with customs and purchasing officers so as to receive constant updates on the list of items that are subjected to the additional levies. It is critical to determine the risk to which you might be exposed to while trading in China and USA. If you are looking for help on USA China freight forwarding contact us online and send a message. You can even message us on Facebook for help on USA China freight forwarding. This entry was posted in News on October 31, 2018 by messengerdev.